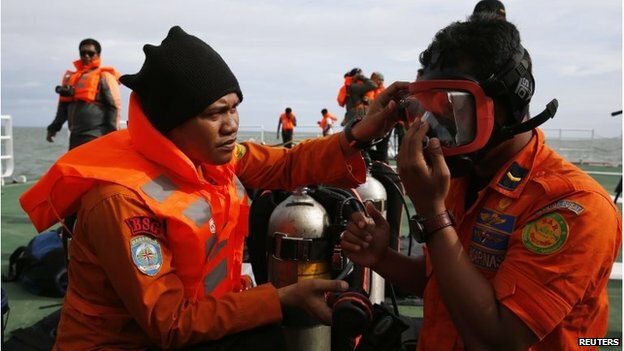 The search for AirAsia flight QZ8501 which crashed into the sea on Sunday has moved underwater, with the arrival of specialist equipment. 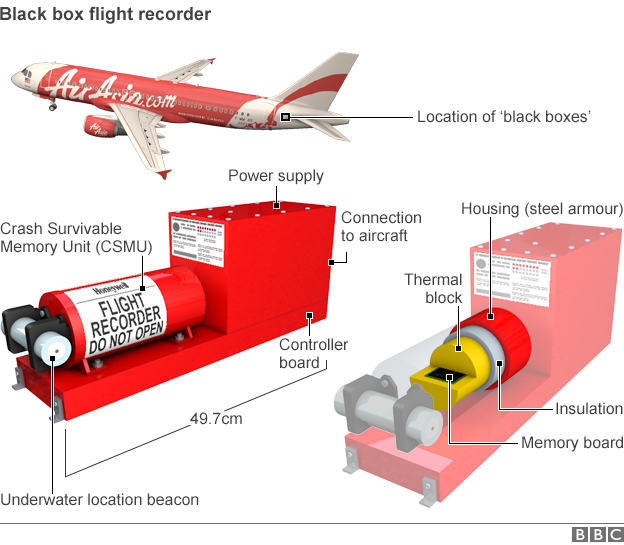 A French crash investigation team is using sensitive acoustic detection devices to try to locate the plane and its “black box” flight recorders. More bodies were recovered on Friday, bringing the total found to 30, said officials in Pangkalan Bun, the closest town to the presumed crash site. Four people have been identified so far. 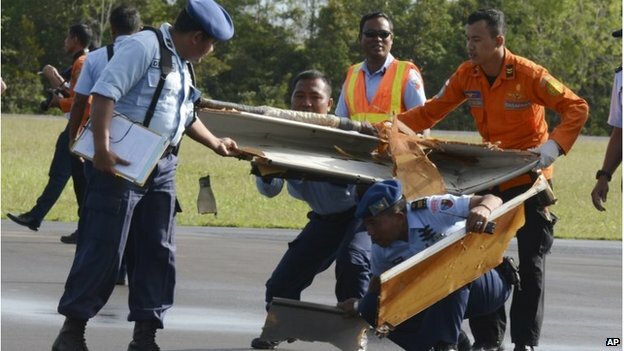 The head of Indonesia’s search and rescue agency, Bambang Soelistyo, estimated the fuselage was at a depth of about 25-30m (80-100ft). But despite a massive five-day search, the fuselage is still missing. Officials say most of the passengers could still be inside. The BBC’s Rupert Wingfield-Hayes in Pangkalan Bun says there is a growing sense among search teams that their task is going to be harder than initially thought. Bad weather and churning seas have dashed hopes of finding the plane visually, he says, and teams will now be relying on scans of the sea floor. The French ship, with Singaporean and Indonesian experts on board, is carrying detection equipment, including hydrophones, to listen out for the plane’s two so-called black boxes – the cockpit voice recorder and the flight data recorder. 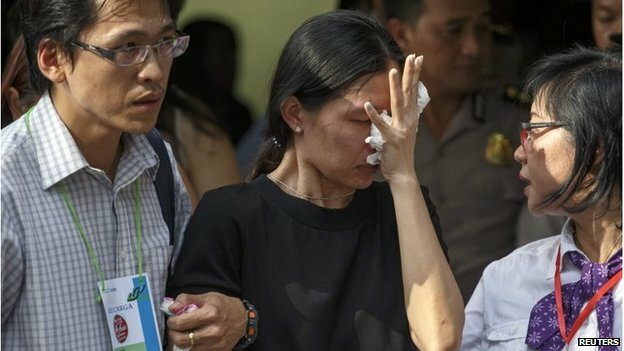 Mr Soelistyo said on Friday that wreckage and bodies were spread over a 5km area of the Java Sea. The search has zoned in on an area of 1,575 nautical square miles of the Java Sea off Borneo, he told reporters. Some investigators are reported to believe that the plane may have gone into an aerodynamic stall as the pilot climbed steeply to avoid a storm. Officials have said the plane was travelling at 32,000ft (9,750m) when it requested to climb to 38,000ft to avoid bad weather. When air traffic controllers consented to allow it to climb to 34,000ft a few minutes later, they got no reply. A source quoted by Reuters said that radar data appeared to show that the aircraft’s “unbelievably” steep climb may have been beyond the Airbus A320’s limits. However, the unnamed source emphasised that more information was needed before a definitive conclusion could be reached. Posted on 2nd January 2015 by newsafrica. This entry was posted in Africa. Bookmark the permalink.